Darlene Barriere: Author. Speaker. Coach. : Does What Really Matter Arise From Our Mind or From Beyond the Mind? Does What Really Matter Arise From Our Mind or From Beyond the Mind? 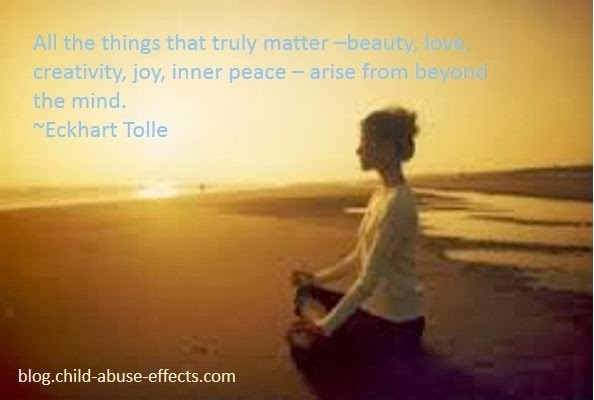 "All the things that truly matter - beauty, love, creativity, joy, inner peace - arise from beyond the mind." When we spend time in our heads, that's when the stream of thought takes over. Sometimes for hours at a time. And often with people that are no longer in our lives! The trouble with being in our minds is that we are often there unconsciously. We're thinking thoughts that we aren't aware of on a conscious level. Many of us spend the better part of our days there. And it's where the ego lives. How many times have you been holding a conversation in your head over a situation that happen a while ago? Perhaps you couldn't find the words in the moment, so now you're coming up with clever responses. Or you're arguing with someone. But this time in a way that has you "winning" the argument. All in your head. Admit it. You've done this. We've all done this. Now think about it for a second. What's the difference between having intense conversations in our heads--quietly of course--and those who are on medication for openly conversing with none existent people? Not much difference at all. Except for the fact that the vast majority of us have these dialogues without anyone knowing about them. But when you become aware of these conversations, it's interesting to watch them. And it's when you get out of your head that the magic starts to happen. When you get still--still as in meditation--that's when you connect with Who You Really Are. And Who You Really Are IS beauty and love and creativity and joy and inner peace. I agree with Eckhardt Tolle. What really matters doesn't come from a thought, which comes from the mind. What really matters comes from deep within. From Who You Really Are.